I believe that this year is a huge year for Oak Tree Community Church. I don't know exactly how to say it any better. I am excited about OTCC. One of my dreams for our church is to take and send people all over the world to make disciples in every nation, like Jesus wants us to do. Last night (March 25) we had some good friends at our church - my former pastor and his wife, Al and Pam Konya. It was a great time of celebrating how God is using them all over central Europe. And Al reminded us of the importance of using modern means to reach modern people, no matter where we are in the world. It takes a strategy. 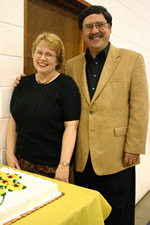 You can find out more about the Konyas' ministry with Word of Life in Hungary at www.eletszava.org. 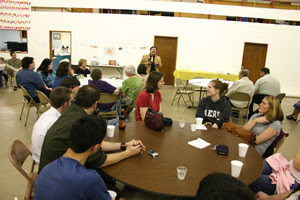 He shared stories of God changing lives in Hungary, Romania, Serbia, and the Ukraine. It's not just about teaching people the Bible. It's about teaching specific people specific things that they can intentionally pass along to others. No one can know everything about the Bible, but everyone can know something. While we're not all called to be formal Bible teachers (see James 3:1), we're all called to make disciples (Matthew 28:18-20), and that means helping people find Jesus Christ and passing along what we know in order to build up fellow believers. "Life is a coat that never fits right. We are forever cinching up here, taking in there, letting out over here. Life doesn't fit our plans. We exist in a continual state of maneuvering, adjusting, shifting, believing, often doubting. Getting through the tough stuff requires it. Thankfully God has provided us with the right perspective. He has made available a Savior, and His name is Jesus. He wants to take the blows for you, to help you through the tough stuff. Truth be told, He can become the rudder of you life when fierce winds blow, your reliable compass when you've lost your bearings, your harbor when sailing on isn't possible. He's the answer. He intersects you at life's most critical crossroads and makes all the difference."